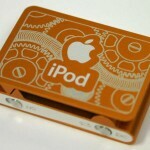 The winner of the custom laser-engraved iPod shuffle giveaway is Jackie Ludwig. The iPod will be on its way to you today. Congratulations, Jackie! If you didn’t win this contest, stay tuned for future contests. Here are the two iPods I engraved this evening. Also check out these engravings. Here is my latest laser engraved iPod shuffle. This iPod is a bit more intricate than my previous one, and was a bit smaller palette to work with, but overall I am pleased with how it turned out. Let me know what you think. Custom Personalized Laser Engraved Name Badges ~ Brand New!